More Ranching Custom and Culture. Dead Wildlife in Water Troughs. Last week, Katie Fite and I travelled to Nevada to inspect several grazing allotments and attend a BLM meeting in Winnemucca and a BLM field trip in the Ely District. While passing through the Union Mountain Allotment in the Elko District we came across a series of water troughs which didn’t have the required wildlife escape ladders. We didn’t take any video of the first trough we found, which contained the carcasses of several dead birds and was dry, but the second and third troughs both had water and contained several dead birds and small mammals. Skull of an unknown bird. 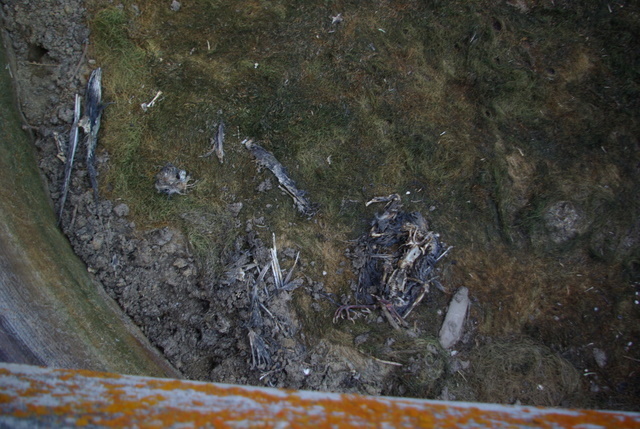 Bird skeletons in bottom of trough. More bird skeletons in trough. The lack of wildlife escape ladders in water troughs on public lands is a violation of the mandatory terms and conditions of the grazing permit but also a violation of the Migratory Bird Treaty Act which was enacted in 1918 to protect birds which migrate through the US, Canada, and Mexico. While not all water troughs lack wildlife escape ladders, there are untold thousands of livestock water troughs on federal public lands which do. Even when the troughs do have escape ladders they are often inadequate because the troughs are so large that the birds or small mammals drown before they ever find them. 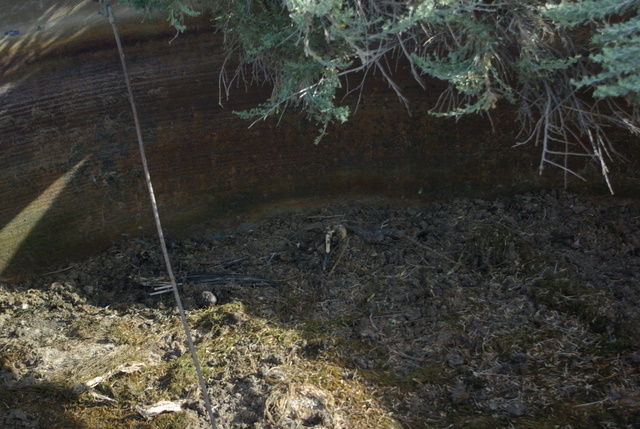 We found such a trough in the Grant Range a few days later with a warbler, grosbeak, and two small mammals. 13 Responses to More Ranching Custom and Culture. Dead Wildlife in Water Troughs. Thanks for posting Ken. I’m sharing on fb. A few years I went on a tour of water troughs on grazing allotments near Malad. Before the tour begin, the B.L.M. representative made contact to inform us he could not make the tour, no surprise there. At the first few stops we found no drowned wildlife. This was odd as their were either no wildlife escape ladders or the ones present were in various stages of falling apart. Then we came up with the following, how far can one throw a “soggy bird”? We fanned out in a circle around the next trough and bingo plenty of dead birds. The one I will always remember was a female Kestrel carrying a fully formed egg. What happened here? You fill in the blanks. I think the “good old boy network” was alive and well. Thanks Ken……will you please post a link to the regulations mandating these escape ladders…design etc? I see this here in Montana quite often and I’ll take pictures in the future. Are trough violations materially sufficient violations of the terms and conditions of a grazing permit to terminate it? If violation(s) are noted, is there duty to cure by the holder of the grazing permit, and/or is there any remedy by notifiying either FWS as enforcement agent under the Migratory Birds Act, or a County/NV Health Department? Is there any other leverage that can be applied to get these guys to clean up their messes/attractive nuisances for disease (especially when one considers avian vectors to move disease around easily)? Thanks for the informative video. Good job. Trough violations, if included in terms & conditions, are certainly sufficient grounds to terminate a permit. Usually a warning (about any violation of T&C) strengthens a manager’s hand in the event that termination is challenged. Usually, if a permittee fails to tend to the trough, there are other issues on the allotment as well that could be sited in any enforcement action. Most allotments are failing to meet or make significant progress toward meeting their respective rangeland standards and guidelines. Managers hold broad discretion to terminate permit for failure to comply with terms & conditions. On the ground – it doesn’t happen – agency is captured. Other trough mishaps that violate the law include the malfunctioning or other failures to maintain valves that halt water once the basin is full of water. Water spilling onto the ground or otherwise wasted violates state water law as a misappropriation of water – at least in Idaho. A snap-shot of an overflowing water trough can be forwarded state officials. Is the BLM subject to any kind of agency audit to determine the level of compliance with its own mandate? I’m sure they’re subject to a GAO audit, but I’m not sure about anything beyond that? Jon Marvel has frequently called for a federal mandate to install a BLM ombudsman but no such internal accountability exists. federal legislators prompt GAO investigations – but the results do little in a political environment dominated by western extractive interests. i can get ahold of the last one done via the GAO but it’s been awhile – it’s a right-wing political atmosphere so in recent times the GAO has been busy investigating environmental public oversight organizations like CBD & WWP for Equal Access to Justice Act (EAJA) receipts to try to validate Karen Budd-Falen’s absurd allegations of environmental groups riding the alleged EAJA gravy train on citizen enforcement. Ultimately, the best source of BLM accountability has been the APA and citizen suit provisions of various environmental laws that allow us – the public – to challenge BLM administration of public lands from outside of agency – EAJA helps make that possible as otherwise we’d be put down by exorbitant legal fees as we tried to take on the legions of government lawyers at the Dept. of Justice. Simply put – no, there is no internal audit of BLM’s compliance with the law – it’s up to us – third-party public organizations – and our members’ contributions and insights to bring compliance with the law. 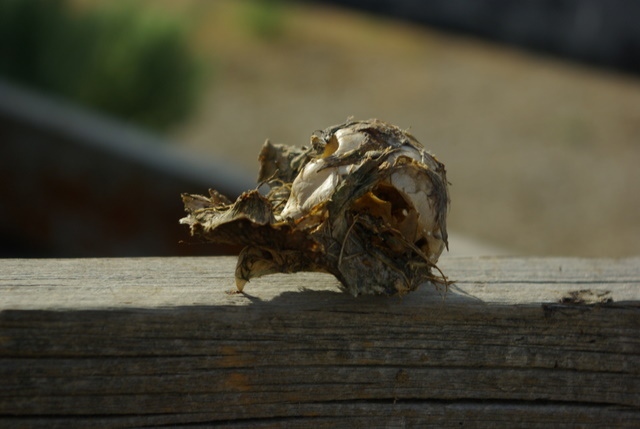 I have seen dead birds in troughs throughout the Big Lost River Valley in Idaho. Most ranchers want you to think they care about the environment, but their actions speak louder than their words. Too many of the water troughs are fed by springs that have been boxed in and piped to the troughs. The springs are no longer available to wildlife. Am I understanding correctly that ALL water troughs/tanks are required under the grazing permits to have ladders? This also applies to Forest Service permits? What is the best way to handle a violation when you see it? I know of at least 2. Yes, this does apply to Forest Service permits because it is required by the MTBA. I would recommend contacting US Fish and Wildlife Service Law Enforcement to report such violations. I used to work with US Fish and Wildlife Service Special Agents in Kansas on violations of the Migratory Bird Treaty, particularly in brine tanks near oil wells, which killed neotropical migratory birds as well as other wildlife. What’s important to do if you want a successful prosecution, is to GPS the location, take photos, take notes, particularly if you can count and identify the birds, but don’t take the birds out of the tank, or take possession of the birds or their remains (it is illegal). Then contact the U.S. Fish and Wildlife Service Special Agent In Charge or the Field Agents. Don’t tip others off, it will just muddy the successful enforcement of the Federal law and treaty. I have also seen dead bats, small mammals, amphibians, and non-migratory birds like quail and pheasants, which are not covered by this Federal law, but might be under State laws and other laws and permits that govern the wildlife traps. Rock doves (pigeons), starlings, and English sparrows don’t count. The FS and BLM are certainly aware of these hazards and educate their own employees and permittees on how to prevent unnecessary wildlife deaths from these nuisance tanks, cisterns, and troughs. It would be interesting to challenge them for not doing something in a ranger district or BLM Field Office to prevent these wildlife nuisances from persisting. The stock tanks and troughs that I have seen lately in Idaho are also growing nuisance mosquitoes, many of which are carrying West Nile Virus and West Nile Encephalitis. As we know, West Nile Virus is taking a heavy toll on many species of birds including sage-grouse, which warrant listing under ESA, but even tiny hummingbirds. Another type of correctable nuisance wildlife killers on public lands are outhouses with ventilation pipes. Seems like FS knows that these pipes can become deathtraps for birds and bats, but they also know how to retrofit them for pocket change. The biggie on Public Lands (FS & BLM) is barbed wire fencing. For sage-grouse, wire fences are often deadly, but can be improved with flashy additions that add to their visibility. Even though BLM and FS have policies on fencing, little of it is in effect or enforced. Again, you as public lands users need to document and voice your concerns. When Ken and I attended a recent US Sheep Experiment Station field research tour in Dubois, ID, the USDA-Agricultural Research Services (ARS) that owns and manages the property admitted to collisions of sage-grouse with their over-abundance of fencing used to control sheep in experimental paddocks. However, they did not seem to know how many and do not even conduct fence mortality inventories nor make their fences more visible to the imperiled sage-grouse, even though they are proud of the high density of leks on their managed public lands. Finally, from my experiences in the San Luis Valley, Colorado where the FWS tried repeatedly to establish a conservation population of whooping cranes to fly with the sandhill cranes that migrate between Canada and Idaho and New Mexico, wires, particularly guy wires and power lines are particularly deadly, especially during take-offs and landings for the big birds. When Katie Fite and I toured the Jarbidge Desert on the Idaho-Nevada border earlier this year, we noted the incredible number of unmarked guy wires on the MET towers for the proposed China Mountain wind farm on public lands. Sure it is windy and they seem to need wires to keep the towers from blowing over, but in the meantime flying sage-grouse, other birds, and bats are placed at unnecessary risk. Again, let the BLM and others know how you are concerned about unnecessary and preventable wildlife killings from ignoring Best Management Practices. Not to get too far off topic, but your work with FWS field agents recalled for me an interesting experience. I spoke at a conference in Wilmington, Delaware years ago. I met a couple of gung ho FWS enforcement guys there. They invited me to Annapolis, MD that weekend, where I stayed at the home of one of the agents, his wife and two kids. The next day my host got a call from his supervisor to do a midnight enforcement raid on Chesepeake Bay, and he received clearance for me to go along. It seems they got a tip one of the nasty industries on the Bay was going to do some midnight wastewater discharge dumping in violation of their NPDES permit. The plan was to take photos, and arrest any personnel found near the discharge site. I think it was industrial sludge with heavy metals and solvents. All of it lethal the fish and wildlife in the Bay. In advance of the scheduled midnight activity, we went to a poker party (other FWS agents), and we, of course, drank non-alcoholic beverages until about 11PM (although I do remember being handed one beer early in the evening), then went down to the boat. These guys were pretty heavily armed, and had enough camera gear and spotlights to make it look like a sizeable force. Very windy that night on the Bay with lots of chop, so after surveying the situation for the better part of an hour in hopes the wind would die down, which it did not, the raid was cancelled. I was very disappointed. I received no word whether the discharge occurred, or whether they got the alleged violators if they dumped. These guys, I will add, were very dedicated and bright chaps. Wish I had kept in touch with them. When you were in the San Luis Valley, did you know Ralph Curtis at the Water Conservancy, have dealings with the Baca Grande Ranch or the adjacent Great Sand Dunes National Monument?